Laurie Landry is a ceramic artist based in St Petersburg. She creates porcelain pieces on the potter's wheel or by forming slabs with her grandmother's wooden rolling pin. When the freshly made pieces are leather-hard she brushes on a black slip and hand carves through to the white porcelain. This ancient process of carving is known as sgraffito. The images that Laurie carves are rooted in her ancestors' past and are inspired by birds who carry secrets to the gods. 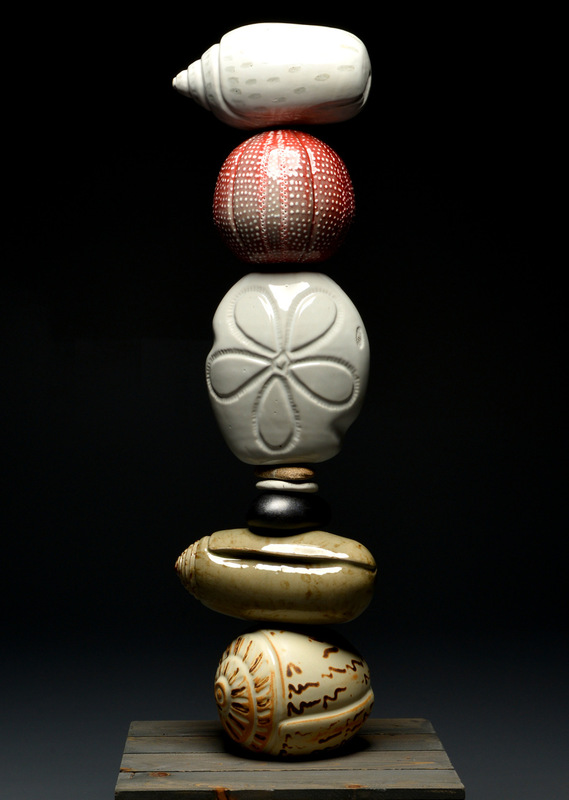 Her totems are a collection of small stoneware elements threaded together telling imaginative stories. Each has its own whimsical personality. They are meant to be "planted" in outdoor gardens. Like most of her pottery these pieces are fired in gas reduction to cone ten for beauty and strength. Her totems can be found anywhere from Canada to Florida. Laurie believes that the vast majority of us are too busy and simply move too fast to notice life's fleeting, beautiful moments. She tries to capture these moments in the clay that she shapes and carves in hopes that the end result will offer a bit more permanence for you to enjoy.